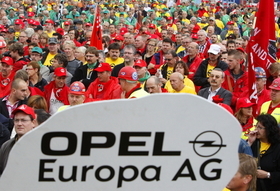 Analysts say Opel's workers have a choice, make concessions or risk destroying the entire business. Opel workers are upset because GM plans to close a plant in Belgium. FRANKFURT (Reuters) -- Opel is arm-wrestling with workers over a restructuring plan, with labor accusing managers of sneaking in extra job cuts as they race to get the plan signed before cash runs out. Opel wants 2.7 billion euros ($3.7 billion) in state aid for the restructuring from countries which host its plants. On Friday, British Business Secretary Peter Mandelson said European governments could consider some support for Opel parent General Motors Co. if the carmaker presents them with a business plan. A spokesman for Opel said on Friday the business plan would be presented to the governments in the coming days. An independent audit of the business due this week marks a step toward securing financing. But without the support of influential labor representatives Opel may struggle to win approval -- and cash -- for its plan. Workers' refusal to cooperate could have drastic consequences for the carmaker. Opel CEO Nick Reilly wants a deal by mid-February, a target that is looking more elusive. After GM announced it would close its plant in Antwerp, Belgium, labor withdrew its offer to save 265 million euros in annual costs in the next five years. If an accord does emerge in the coming days, the way is clear for governments of countries with Opel plants to set out their contributions to the restructuring. Germany accounts for more than half of Opel's 50,000 strong work force, and GM's proposal for job cuts across Europe reflects this. Reilly said last month that 4,000 out of a total 8,300 job cuts would be in Germany, although labor leaders argue the total is now much higher. While the restructuring plan may look like a bitter pill, workers would be well advised to swallow it, argued IHS Global Insight analyst Tim Urquhart. "They have got about 20 percent to 30 percent more capacity than they actually need, and that's what Reilly is trying to address. They can either get on and help that process and swallow some of the pain, or destroy the entire business," he said. "At the moment it looks like they are going to try and destroy the entire business," he said. Opel's decision to close Antwerp has made negotiations with the European works council fraught, but failure to reach a deal could have serious consequences. The carmaker says it has money to keep operating "well into the second quarter" but governments want the plan signed off before they commit taxpayer cash. British Business Secretary Peter Mandelson said on Friday that European governments could consider some support if the carmaker presented them with a business plan. "The government can only help if this total concept is presented. To pay just because announcements have been made -- that will not work," said auto expert Willi Diez of Germany's Institute for the Automotive Industry, referring to the broad outlines of the plan Opel has already made public. GM has said restructuring Opel will cost 3.3 billion euros, but experts estimate it needs double that to cover the costs of developing its next new models. "That is the crux of the matter. How do we secure our financing? And it is by far not secured," said a person familiar with the restructuring plan. Opel's labor leaders have considerable clout with the German government, and ministers have already cast doubt on state aid for Opel, criticizing GM's plan. "It would be unpopular if the government aids Opel," said car expert Wolfgang Meinig, head of Automotive Industry Research in Bamberg. Tempers are already frayed after GM backtracked on months of fraught negotiations to sell Opel, opting last year to keep it instead. Politicians in Berlin and in states where Opel has factories felt they were misled. "The government is just livid at GM because of Opel," auto expert Stefan Bratzel of the Centre of Automotive in Bergisch Gladbach University. GM may have to provide more cash itself if it wants to make Opel profitable. If German unions continue to block the plan and the government refuses aid, other Opel countries -- Britain, Spain and Poland -- could seize the opportunity to make their voices heard, pledging cash and cooperation and taking on more influence in the talks. "It's a bit of an extreme scenario, but it is possible," said IHS Global Insight's Urquhart. Opel's fate has been hanging in the balance for over a year, and Opel employees won't give in easily to GM's demands. "We will push through with our plans," a union representative said. "We should not lose our nerve. There will be no contributions from the workers until we have a clear solution on certain points." Workers' determination to resist GM's restructuring efforts should not blind them to what Reilly has referred to as the "new reality" of the European car market, analyst Urquhart said. "There has to be a rationale, the business has to make money. If Opel workers can't sort themselves out then there may be a greater restructuring, or they may be shut down." Opel, like the rest of the European auto industry, is stuck in a "Catch-22" situation, Urquhart said. "They've got a stark choice. They can work with management to create a viable future for the company or they can drag the company down into the mire."